More than a tool, it's an heirloom. Lefties rejoice! The popular DeWit Cape Cod with ergonomic P-grip handle is the perfect tool for you. The longer handle on this tool allows you to use both hands to provide more leverage. It also offers extra reach for all your weeding chores. Pull the blade just under the soil surface, cutting weeds off cleanly. Ideal for confined areas and in between plantings. Great for working in raised beds and when using a kneeler seat. A popular choice for seniors or anyone who suffers with hand pain or cramps. Constructed of tempered boron steel with ash handle. Earth-friendly way to tackle weeds. On April 1, 1898, Willem DeWit started his blacksmith company in a small village in northern Holland. Today, the 4th generation of the forging family is running the company. Old-fashioned quality combined with innovative designs make DeWit the ultimate gardener's choice. 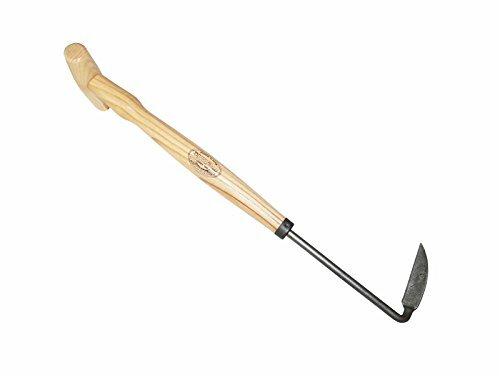 Using the latest equipment and techniques combined with historical craftsmanship make DeWit one of the most respected garden tool manufacturers in the world. DeWit tools are made from high quality Swedish Boron Steel. The Ash hardwood handles come from FSC (Forest Stewardship Council) certified forests. Tierra Garden is proud to offer these superior tools in the United States!